Traveling or not, how do you stash your cords, cables, and wired earpieces? * How do you tie things up? Hang things? I have 4 great ones to recommend. All light weight. All handy. For larger cables and to hang things, Pixi by Blue Lounge. Bongo Ties, also for hanging and wrapping. Velcro is not one of my options or recommendations. The stuff that catches on your clothing, snag women’s stockings, tights, and find shirts and skirts. I’ve found it to be destructive just hanging around in my bags or hanging out on a cable as I’m unwrapping it or using it. It’s hard to believe I am only just recommending them to you now, in 2017 because I have been using and loving the Cord Taco since January 2014. It’s time I let you in on this! 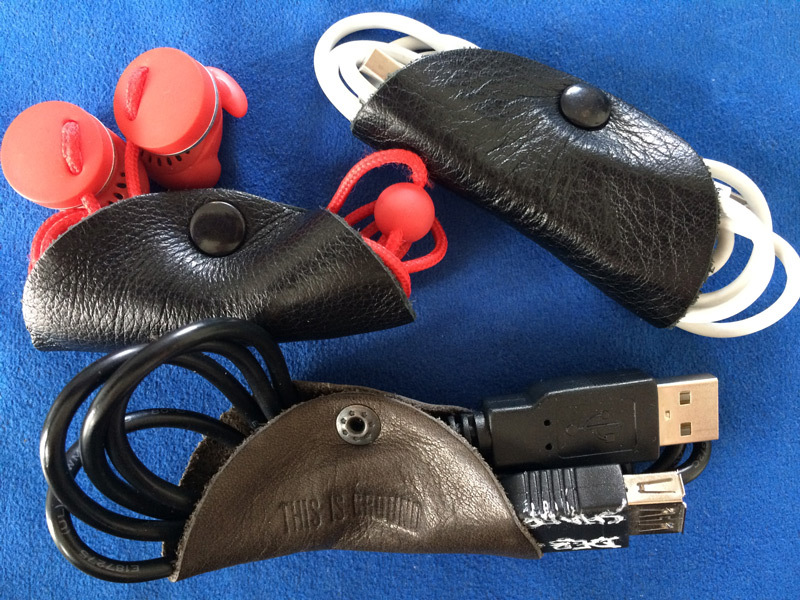 This is a Cord Taco, a beautiful, durable premium leather cable wrap that keeps your cables untangled better than anything else I have ever tried, and I have tried pretty much all cable organizers. This photo is of one of the original Cord Tacos. I have been using it since January 2014, almost 3.5 years. This size is approximately 3.25 inches at it’s widest point. I love the Cord Taco because my cables never tangle! Plus, they are leather! They smell so nice and have held up so well that they still look new after 3 and a half years! And, their fine look and the smell of the leather are a bit of elegance in my life. I use my Cord Tacos to wrap the cable I use to charge my iPhone, and my USB extension cable (shown here), all of which I carry daily. I also use one for my longer micro-USB cable which remains in my backpack for device charging at night. 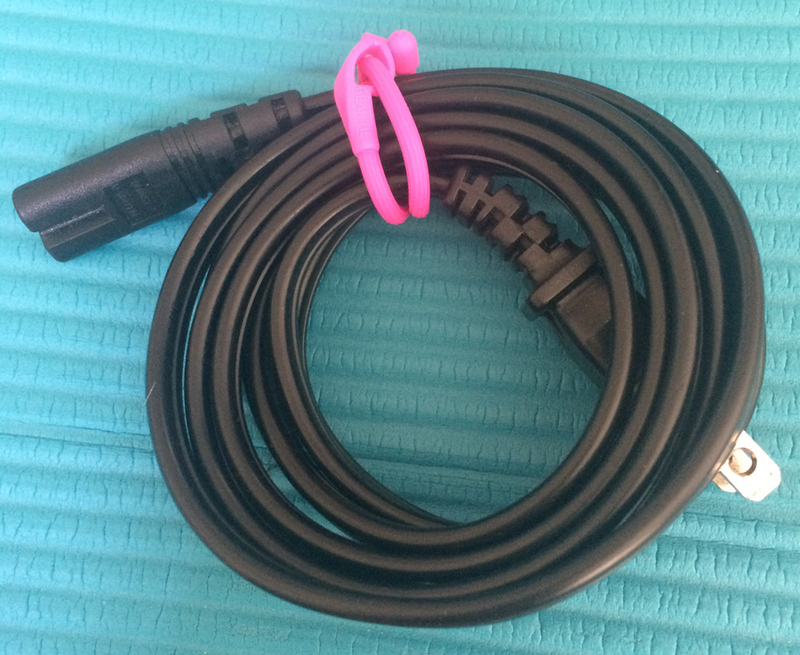 For almost 3.5 years, so far, I have been able to wrap my cables into my Cord Tacos, then simply toss it (yes, toss) into my handbag, backpack compartment, or ditty bag of tech stuff — and find it perfectly intact, untangled later on when I pulled it out to use it. For longer or thicker cables, Gear Tie Reusable Rubber Twist Ties provide flexibility. They come in multiple sizes. Gear Ties have a bendable metal core and are wrapped in a soft, non-slippery rubber. A button hole style loop enables you to make your wrap more stable. I am using this 6-inch length Gear Tie to wrap the plug that powers my computer. I will be traveling with two or three lengths. They are a new addition to my travel bag so after using them a while, I’ll keep you apprised as to how well they work. These smaller Gear Ties are great for keeping cables wrapped. (Larger ones keep a lot more bundled.) However, for hanging things, read on… to Blue Lounge’s Pixi ties. For larger items such as a bedroll or yoga mat, car charger, and to hang items off the ground, Blue Lounge’s multi-purpose ties called Pixi can be very handy. 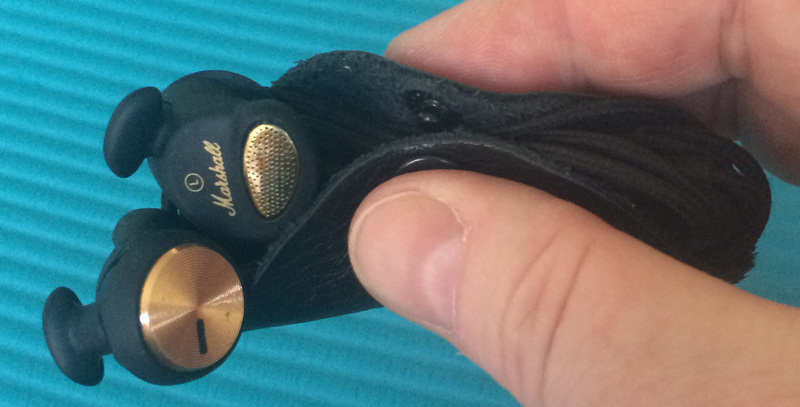 They are fabric-wrapped elastic and the elastic locks into place within the slide that’s at one end. Check out their instructions and video to really see. For smaller items, I find them a bit bulkier than I prefer as a traveler or as a woman trying to keep my handbag compact but to be fair, that’s because of the locking mechanism. I’ll be traveling with a couple from the medium set. One of my key reasons is that there are times when I don’t want to put my bags on the floor, on a bed, or on a questionable shelf. If camping, your food bag. Hang your night-time bag (pajamas, toiletries, towel) from a closet handle or bunk bed frame rather than keep it in your bed. Hang a bag of your stuff rather than placing them on questionable closet shelves. In a busy kitchen, hang your day bag so it’s not lost on a chair or sitting on a well-cooked-on counter. They are a new addition to my travel bag so after using them a while, I’ll report to you about how well they work. I got my Pixi ties at RadTech.com. Bongo Ties are an old favorite of mine. The high-grade rubber in these enables them to stretch a lot. (After 4 years of use in my travel bag, a couple did dry out.) I have used them to hang my handbag at a fair, to hang my night-time bag from my bed or in the shower, to tied cables, and even to hold my rear view mirror in place when California’s extreme heat made it come unglued from my windshield. I’ve been using them since before 2011. Here’s one handy use. Before I discovered that I didn’t have to use Apple’s little flip plug, I had to use a European/Israeli adapter and the weight caused problems so a Bongo Tie kept me plugged into this extension cord. *Think me behind the times because I still use a wired earpiece? I’ve had many, many Bluetooth ear-things over many, many years. But when you’re traveling they are just one more thing to keep charged. Same when living in one home. I also dislike in-ear sound input as I prefer not to make myself deaf. 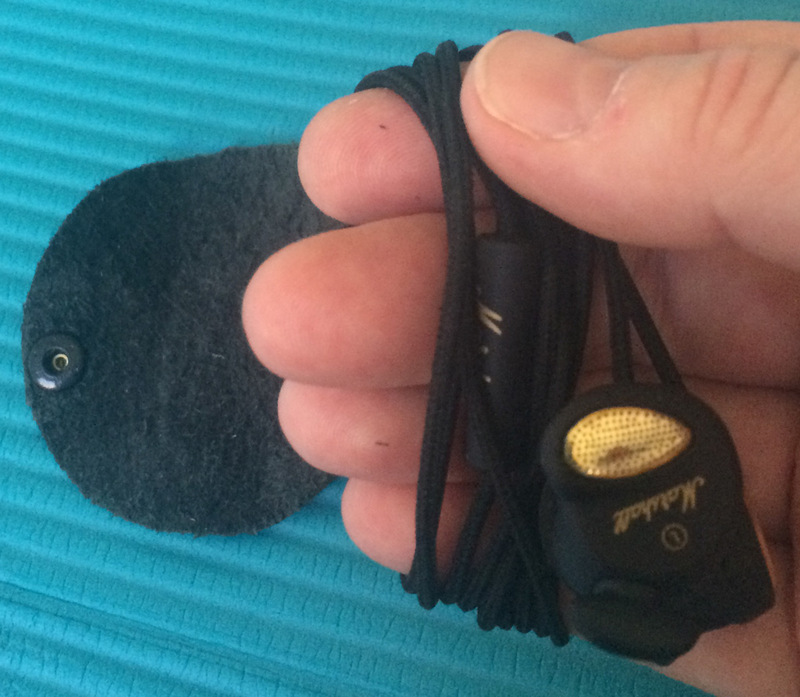 Medis, the Urbanears on-ear earpieces, sadly not further marketed by Urbanears, are the best and healthiest I have every seen or heard. And they are wired.